Last night in St. Mark’s Lutheran Church the American Bach Soloists (ABS), led by Artistic & Music Director Jeffrey Thomas, gave the first concert in the Festival portion of the 2017 ABS Festival & Academy. The title of the program was Water Music by Handel & Telemann. In this context George Frideric Handel is the more familiar composer, while Georg Philipp Telemann’s music tends to be performed with far less frequency. Nevertheless, the juxtaposition made for a fascinating study of the contrasting social context in which each of these composers plied his trade. Handel’s context is well known. 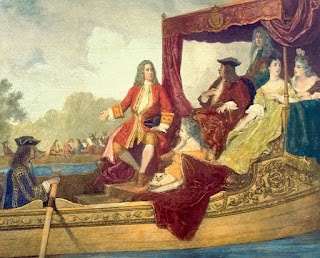 As evening fell on July 17, 1717, a royal barge carried King George I and members of his retinue on an excursion up the Thames toward Chelsea. To keep the king and his companions entertained, another barge sailed alongside, carrying about 50 musicians playing music by Handel. The composer would later collect his pieces into three suites, sorted by key. Known today as his Water Music, the suites are HWV 348 in F major, HWV 349 in D major, and HWV 350 in G major. Apparently the king liked the music so much that all of it was played three times over the course of his round trip. The result is pure fantasy. The sky is too bright, even for a summer evening in London. The royal barge is too small for the number of people it contained (which would have included servants as well as nobles); and Handel was not one of them. One also sees the musicians, again in a vessel clearly not large enough to hold 50 of them! Nevertheless, the fantasy endures. Fortunately, the music endures as well. Last night’s concert began with HWV 350 and concluded with HWV 348 (each of which was played only once). Handel’s music, for the most part, was based on the sorts of courtly dances found in most suites composed during the Baroque period. Performance often involved several repetitions of a single section with instrumentation shifting between the strings and the wind and brass resources. There were also a few more “rustic” dance forms, including, given the nautical setting, a couple of hornpipe movements. The selections also offer an abundance of opportunities for solo work. The Allegro portion of the Overture for HWV 348 involves a dazzling display of exchanges between the leaders of the first and second violin sections (Elizabeth Blumenstock and Robert Mealy, respectively, last night). HWV 350 provides solo passages for both flute (Sandra Miller) and recorder (Hanneke van Proosdij); and, unless I am mistaken, it is the only one of the three suites to employ these instruments. HWV 348, on the other hand, features two natural horns (Paul Avril and Academy alumna Sadie Glass) in a generous number of its ten movements. They are also included in the last two movements of HWV 348, which are variants of the first two movements of HWV 349, which require both horns and trumpets. The second of those variants is the Alla Hornpipe movement, which is probably the best known of all the Water Music pieces. As always when he is leading ABS, Thomas gave a crisp and spirited account of all of these Handel pieces. They may have been written as an entertaining diversion, but original context does not make them any the less appealing. Besides, this was music that had been programmed to launch a festival; and the selections could not have been more consistent with that nautical metaphor. Telemann’s suite is far more programmatic than any of the Handel suites, which likely appealed to the prevailing merchant class of Hamburg (who probably had the resources to support his pay raise). Most of the movements evoke mythological figures, although the suite concludes with a dance for the “merry boat people.” However, there are also signs of attempt to visualize the Elbe itself. This is most evident in sustained passages for the two oboes (Debra Nagy and Stephen Bard), beneath which the strings churn away with ebb-and-flow activity. Then, when the thematic material is repeated, the roles of winds and strings are reversed. Telemann clearly appreciated the difference between courtly and mercantile life, and we observe this in his efforts to provide music that is quickly recognized as more than a casual diversion. Last night’s program seems to have been prepared in a spirit that recognized that this would be an evening of social contrasts, rather than just one of musical diversity. 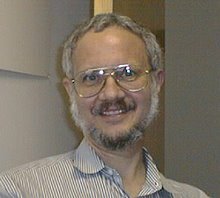 Thomas effectively captured the social shift in Telemann’s context, endowing the entire event with a thoroughly engaging compare-and-contrast experience.